Jeff Gordon and Richard Petty have a combined 11 NASCAR Sprint Cup Series championships and 293 total victories. 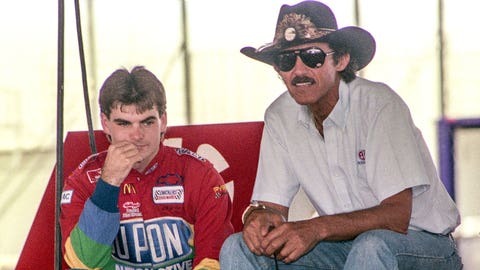 When Jeff Gordon made his NASCAR Sprint Cup Series debut at Atlanta Motor Speedway in 1992, it was the final race for NASCAR’s "King" Richard Petty. As that day kicked off, Petty presented each of his competitors with a commemorative money clip during the driver-crew chief meeting. Gordon remembers that day fondly, and often talks about how special that money clip is to him. With Gordon now preparing to make the final start of his NASCAR career, Petty presented the four-time champion with two special retirement gifts of his own. Away from the hordes of fans and media attention surrounding Gordon this weekend at Homestead-Miami Speedway, Petty gave the Hendrick Motorsports driver one of his iconic Charlie 1 Horse cowboy hats, with his signature autograph on the brim. Petty also presented Gordon with 93 one dollar bills for the money clip he gave him 23 years ago, one for each of his Sprint Cup victories. "The King" has another dollar with him, in case Gordon is able to score the victory Sunday at Homestead.